How Radiant Heating works . 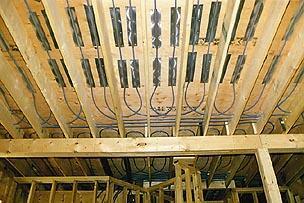 . .
Not as popular as it once was, customeras are still installing radiant floor heat in their homes. This heating involves pumping warm water through specially designed tubing laid under or within the floor. The gentle warmth radiates from your floor as it rises, warming you and objects in the room FIRST. 1.) For lower levels, basements and garages the tubing is tied to reinforcing mesh before the concrete is poured. This is the most popular option our customers have chosen. 2.) The tubing can also be installed over suspended wood floors and covered with poured floor underlayment. 3.) The tubing can be placed over the sub-floor with the tubing resting in heat transfer plates. 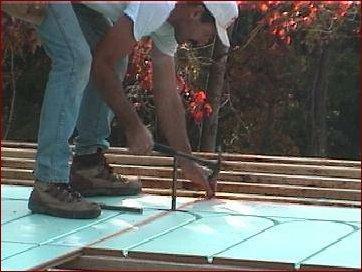 This is excellent for remodeling projects and additions. 4.) Stephens Heating also uses WarmBoard subflooring technology. These panels are equipped with modular channel patterns that automatically procure the tubing layout, saving time and money. 5.) 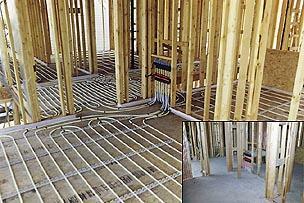 Finally, the tubing can be installed between floor joists in your existing home, making it easy to switch to radiant floor heating. Click on the link below to read more . . .
Click logo above to download WarmBoard brochure!